Concerning the "15/64" float height setting for the Holley NH: as best as I understand, the goal is to set the depth of fuel in the bowl so the venturi jet introduces the proper fuel into the mixing chamber based on the engine vacuum (RPM?). We have two ways to control the fuel/ air mix: fuel height in bowl and mix needle adjustment, and I think they respond differently to engine RPM, so they both need to be right. Can someone explain how the bowl depth and mix valve setting work together to set the mixture over a range of engine RPM? What conditions would suggest changing the float height instead of adjusting the needle? I'm sure I could sit down and start doing some math to figure this out, but something tells me you guys know the answer without digging out the textbooks. Not sure about your question but I don't think the height of the fuel in the bowl effects the carb settings as you seem to think they do. One does not affect the other. Low or high fuel levels in the bowl cause their own problems but these problems don't affect the carb needle setting at all. As to the setting; I've done about 18 or 20 NH's and sold most. I've always set the float dead level with the carb body turned upside down. (Level with the rim where the bowl gasket goes). There are a few illustrations that show this method. Eyeballed by the way. No problems. Keep it simple. Arthur, yes the fuel level is important. However, you mention engine vacuum. That is not as important- keep in mind when you have the least engine vacuum is when you want the most fuel. Venturi vacuum is important. As air passes through the carb venturi, it creates venturi vacuum that "pulls" the fuel up the jet into the air stream. The higher the fuel level, the easier it is to "pull" up, so the richer the fuel mixutre. The lower the fuel level, the harder it is to "pull" up, so the leaner the level. Most "modern" cars with carbs (now also vintage) have fixed orifices for the main jets, and adjustable only for idle. The T uses one adjustable for everything. Pull is in quotes as it is actually atmospheric pressure that pushes the fuel up. I'm certainly no expert, but I don't view the float level as something that should be tweaked or used to 'control the air fuel mixture'. Without looking at a drawing, I couldn't be sure, but I suspect the float level is meant to have the fuel at a certain level in relation to the position of the jets so that the pressure (Head) is at a predictable value on which the design was based. I believe the only intended 'control' was the needle. Changing the float level will certainly change the mixture if nothing else (needle setting) changes, but I also believe it will throw off the delicate balance of the way the system was designed to operate. Hal, agreed, typically the float is set per specs. Only in unusual situations would one use the float level for adjustment, but it is done at times. Once you are past starting the car and idle, the float probably never closes much. 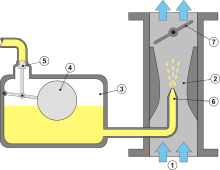 Ie; the float stays open as long as fuel is being used at a rate that is faster then the valve would close at idle or low RPMs, so what level it is set at, may not match the level in the bowl, it would be lower. If the lines are not clear and you do not have a good flow, the fuel could be used faster then it can be replenished so the level could be really low. I don't pretend to understand the "theory", but from practical experience, If the float level is too low the engine will run just fine at low speeds and idle, but when trying to pull a hill it will starve. Under those circumstances, if I push up on the throttle it runs better than when it is all the way down. If I get the float set right, it will run fine with full throttle. Here is another link that mentions what I described, how the float level affects mixture. See paragraph four. That link is not for a holley nh. There are however, many good sources for model t and even holley nh carbs reference, specs, rebuild information, etc, with the model t service manual, ford service bulletins, mtfca publications, and great expert advice in the forum archives. I know it is not a holly, but the physics are the same.